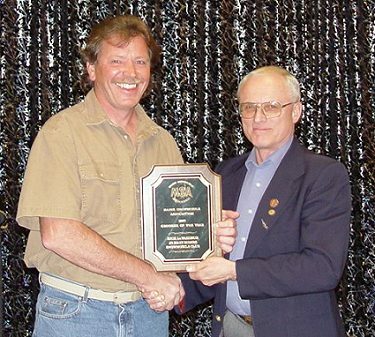 Maine Snowmobile Association's 2007 "Trail Groomer of the Year Award"
from Larry Lafland (R), Coordinator of MSA's Trails Committee. Get $25 off all rooms from now until January 31, 2013. Call 207-723-5045 or email for Reservations. Rick Levasseur of the Jo Mary Riders Snowmobile Club on South Twin Lake (Millinocket) was named "Groomer of the Year" by the Maine Snowmobile Association (MSA) at their 39th Annual Meeting and Banquet at the Merry Manor Inn in South Portland on Saturday, April 21. It was noted in the presentation that LeVasseur was being honored as a grooming innovator and for his overall dedication to snowmobiling. He oversees 92 miles of trails in the Jo Mary Lake area and is a perfectionist and a leader in the industry. 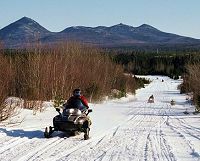 He was instrumental in the creation of the Katahdin Loop Trail, which has become one of the state's most popular snowmobiling destinations. LeVasseur and his wife Debbie own 5 Lakes Lodge on South Twin Lake. 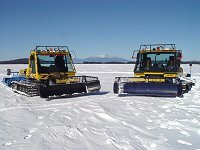 Read more about Snowmobile Lodging at 5 Lakes Lodge. 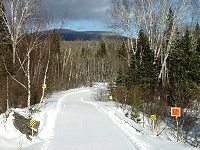 For a trail map and trail info, visit Jo Mary Riders Snowmobile Club.